Ryan has always sought her out in a crowd, pauses each day just to see her pass by his locker, he breathes just to see her smile, so when she finally approaches him, he can't believe she even knows his name. Brooke, the bubbly and full of life senior and the shy Ryan, an upperfreshman strike up a loving friendship. Ryan is in love with the girl who only wants to be his friend. How can he make her see that he isn't just 'The Kid' anymore. When Brooke leaves for collage to escape her home life, Ryan knows he needs to move on. He'll always dream of the day Brooke returns, but how will he ever fall out of love with the girl that can still consume him? A cute little novella. Light and fluffy and I found myself feeling quite sorry for Ryan and being overwhelmed by unrequited love. 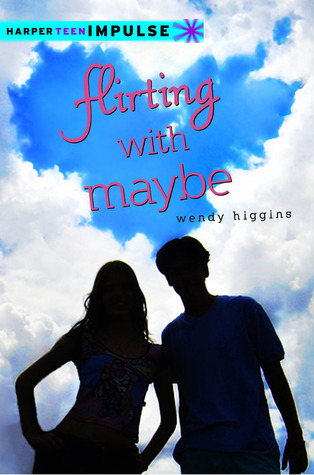 But the real attraction of Flirting With Maybe, is the Prologue and first chapter of Sweet Peril. It's actual only 92 pages. I breezed through it in around two hours. It's a completely separate book from the Sweet Evil series, just the same author. But it does contain an excerpt from Sweet Peril (the second book in the Sweet Evil series). Have you read Sweet Evil yet?